How Do I Know if I Have a Snapping Hip Syndrome? Snapping Hip Syndrome is a progressed form of tendonitis that can cause damage to the tendon and create severe pain. It is often the result of injury, overuse, improper knee alignment or weakened muscle strength that cannot support the hip effectively. The patient will feel or hear snapping or popping of the hip as it rubs abruptly over the tendon. 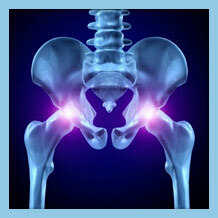 The hip area can be tender to the touch and feel inflamed. Walking and other activities that require hip flexibility will be uncomfortable or painful. Do you have any of these symptoms and think you may be suffering from Snapping Hip Syndrome? We have a quick and easy tool to help gather some information from you to help us determine what your problem is and get you on the road to recovery. Treating a snapping hip requires some rest, anti-inflammatories, and possibly steroid injections to help the tendon relax back to a normal state. Once tolerable, preventative measures, such as stretching before activities and avoiding over-use of the hip, should be practiced daily. If the snapping hip syndrome becomes an ongoing problem, your doctor may recommend hip arthroscopy to help release the aggravated tendon. OLSS provides a wide range of treatment options and because our doctors are the most experienced and best trained in treating Snapping Hip Syndrome, we are able to perform many advanced treatments other practices may not be able to offer. The real question is “what treatment is best to treat your snapping hip or popping hip?”. Use our Treatment Check tool to quickly get started in finding the right treatment for you.